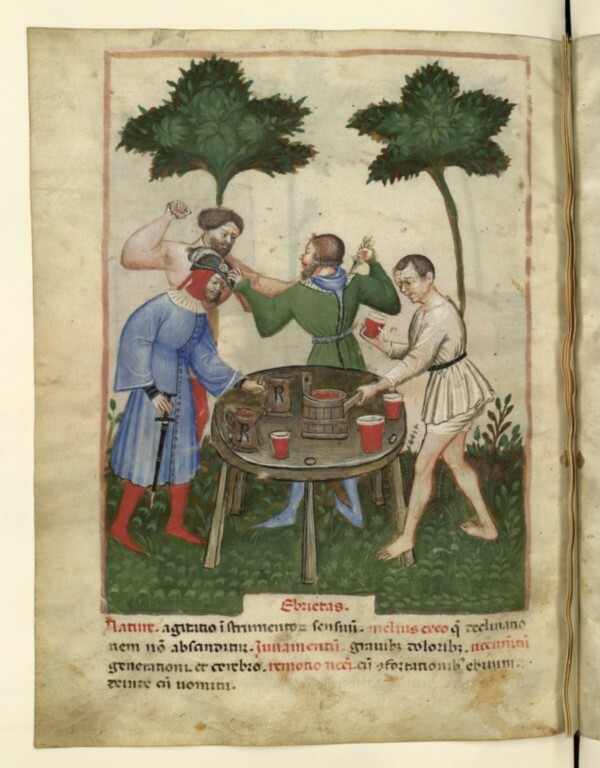 This image illustrates drunkenness (Lat. ebrietas) in a Tacuinum Sanitatis from Italy in the 1390s (Bibliotheque Nationale du France, Paris MS. Nouvelle acquisition latine 1673 folio 88v: for this and other images see their Mandragore website http://mandragore.bnf.fr/jsp/rechercheExperte.jsp). The Tacuinum is a Latin translation of an Arabic book on the medical implications of various foods, activities, winds, and kinds of clothing. The man without a dagger stands ready to punch. Is he grabbing his opponent at the neck, or trying to catch his opponent’s dagger hand? The artist does not make it clear. By itself, the image of the man without a dagger would be hard to interpret. Is the way he has drawn back his arm before punching meant to show that he is clumsy or untrained, or just a way to make his hand visible in a crowded picture? It is certainly different from the boxing stance which many people today recommend for unarmed combat. But this image can be compared to another kind of source, didactic literature. 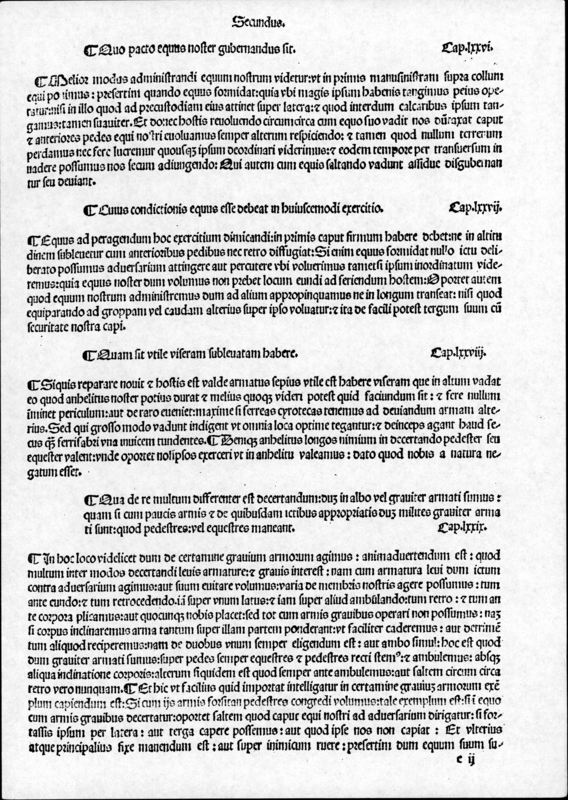 Some time around 1405 or 1410, the Italian fencing master Fiore dei Liberi had someone sketch his first defense against a dagger for a new version of his fencing manual. The following image of MS. Ludwig XV 13 folio 10v at the J. Paul Getty Museum, Malibu comes courtesy of their Open Content Program. Here, the man with the crown (a Remedy Master) has intercepted the attack and pushed it aside. He is about to strike his opponent in the face and twist the dagger out of his hand. 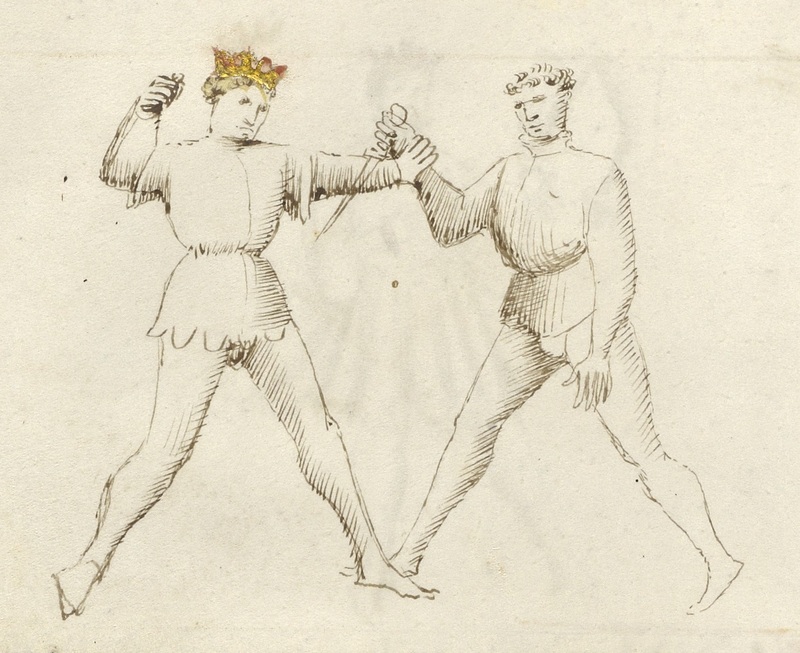 The position of the master’s right hand looks odd to modern eyes, but the comparison with the Tacuinum suggests that it might have been an ordinary way to punch in late 14th century Italy, in the way that many Canadians today will adopt a boxing stance if asked to throw a punch.